The atheist parents surveyed had multiple reasons for attending religious services in the absence of religious belief. Some said their spouse or partner was religious, and encouraged them to go to services as well. Others said they enjoyed the community that attending a church, mosque, temple or other religious institution can bring. Perhaps most interesting, Ecklund said, was that many atheist scientists take their children to religious services so that the kids can make up their own mind about God and spirituality. "We thought that these individuals might be less inclined to introduce their children to religious traditions, but we found the exact opposite to be true," Ecklund said. "They want their children to have choices, and it is more consistent with their science identity to expose their children to all sources of knowledge." I hope one day, either the children or the parents decide to see what else is interesting, and drop by a church. I've often thought that if those Atheiests that have a chip on their shoulders were so up in arms about Christmas as they claim to be, why take the day off and holiday pay? I guess a day off and some presents is too neat to miss. So I guess they want like a buffet holiday? Take what you like and complain about the rest? Apparently. I'm thinking some of them may have been raised religious and still want to do the things they used to do. They are trying to convert the day into something else. Just as the Christians converted Pagan holidays into Christian holiday's over time. Introducing reindeer and elves. Santa Claus over time Christ is forgotten. I know of a couple of people who are not religious and would self-identify as agnostics who are actively seeking to have their children take part in religious communities, including one who is taking her young child to an Orthodox church. Her reasoning is that she attended a church when she was a child and it was very personally beneficial to her, and she wants her daughter to feel like she, too, is part of a community. Christianity seemed to offer that better than anything else in her area. She chose Orthodoxy because as a semi-pagan she feels like it has enough mystical appeal to meet that aesthetic in her life. We will see how it turns out. As for atheists celebrating Christmas as some kind of secular/family-based holiday, why not? It is a part of their culture, and apart from attending church on Christmas day most of the cultural traditions associated with Christmas can be washed of their religious meanings. EDIT: Heck, I know pagans who celebrate Yule. It's their season, too. The winter solstice season was a time of feasting and celebration long before Christianity came on the scene. There seems to be some recognition of it as such in a large number of very diverse cultures. The birth of Christ was never the 'reason for the season', it's just been the latest fad in the west for the last 1000-1500 years or so. Plus, it's kinda getting old, it was not Atheists and Agnostics but other Christians that resurrected various elements of Germanic and Norse mythology to spice the season up a bit. Furthermore, it's not just non-Christians who view season as something more than or different than the birth of Christ, you'll probably find that most Christians are also primarily focused on the other, less religious, aspects of the holiday season. Celebrate "winter solstice season", then, and take pride in the fact that your holiday pre-dates ours. "Christmas" means the nativity of the Word of God according to the flesh, full stop. People calling themselves "Christians" had better wisen up to this fact, as well, and stop mistaking winter solstice season for Christmas. They don't always have the choice. If you work in a small business that's closed on 12/25, it's not up to you. Didn't the article state that many athiest parents take thier children to services so they can see what they are like? That may be what you want Christmas to be, though from what I know of the history of Christmas celebrations it never really was what you think it should be, at least not outside of monastic communities. For most people in our society, the reality is quite different than your ideal. And it's obviously not some atheist conspiracy against Christianity, it's simply how the holiday naturally evolved in our culture and society and that fact is not going to change simply because you want it to. I am all for my employer observing every holiday celebrated on the planet and paying me not to come in. Time for this pluralism to start paying off. IIRC didn't the eastern Church orginally celbrate Christmas as part of Theophany, in one big feast? If that's the case you better throw out all forms of holly, ivy, Christmas trees, Western Christmas carols, the yule log, and just about every sort of celebration of Christmas outside of going to All Night Vigil and Liturgy. Why, because the truth of the matter is that most things we Christians associate with "Christmas" have pagan origins. I don't think any of us are in a position to judge anyone else's celebration of a holiday. I frankly don't understand why it should bother you if your non-Christian neighbor down the street puts up a tree and exchanges presents on December 25th. Are they stopping you from attending Liturgy and celebrating Christmas as you see fit? No? Well then move on with your life. I personally don't like Santa Claus or the American fiction associated with him. Does that give me the right to judge my Orthodox friends who raise their kids with the story of Santa Claus? No. That is between them and God. So get off your soap box and come back down to reality. Most of us in this world (and on this forum) are not monastics, and the Church does not expect us to live like monastics. That means in addition to the icons of the Nativity in our homes, you will find poinsettias, holly, ivy, Christmas trees, snowmen, and a whole host of other winter things. Although these things may be a carry-over from winter solstice celebrations, to me, they are the fulfillment of the verse "All of creation rejoices in thee" from the Axion Estin. Handmaiden, you are putting a lot of words in my mouth, probably fairly as I didn't bother to type out all my thoughts. I am not one of those who objects to Christmas trees and snowmen per se. I object to these being the sum total or the greater part of Christmas for those calling themselves Christian, which is too many of us (I include myself in this). Separately, I also tire of atheists doing their snide "Christmas is just the feast of Sol Invictus anyway, hahahah, dumb Christians" routine from around November each year to that year's end. But you're suppose to be an atheist and so you shouldn't celebrate jack! You shouldn't celebrate any of it! Regardless if it's Christian or pre-christian pagan. The truth is, you guys are just another brand of consumer driven buffet cultural Christians! You can't strip away everything christian from your life. There will always be some vestiges still left. Even if you are unaware of them. Your atheistic children will be able to see and may become more consistent in their atheism. But at the end of the day atheism can't really survive on it's own. It's a parasite that needs religious people to feed off of. As individuals you guys need to marry religious people for you can't really survive on your own. You guys are way too small a group. And if atheistic families only produce one child then they will either die out or will always be an extremely small minority. Thus secularism won't last forever. The rise and fall of nations and boundaries of borders will always be in a state of flux, and the strongest temporary players will be the ones to make up the rules, the constitutions.......etc. So enjoy your rugged individualism as an atheist while it lasts. For it won't be like this forever. Doesn't the feast day of Christmass last for 12 days? Or is that just a western christian christmass feast day tradition? But at the end of the day atheism can't really survive on it's own. Is there anything that can survive on its own? Good question. It depends on how wide you want to broaden the scope. In my context, I was talking about people groups. Larger ethnic groups or people groups are able to survive without depending on another ethnic group or people group. We can look at mid-evil Japan as an example. They were pretty much all by themselves for a number of centuries. Atheists must feed upon all religious groups/people/societies all over the planet. They must do that until they grow large enough to become sustainable, but what I'm seeing is that instead of being satisfied on becoming just another people group in competition with everyone else, they are using secularism as the vehicle to convert all societies on the planet.......especially in the western world, into defacto atheistic republics. Why do we hate Iran so much? Why do we talk so bad about their government being a theocracy? What is it about their way of life, their government that is such a threat to our way of life? Our secular societies? Why must we work so hard in trying to eradicate their governmental system? Now I disagree with Shi'ite Islam and Iran in general, but the reaction I saw from American secularists always seemed odd to me. For it seemed as if they were using us christian Americans, mainly the American far right, to get their way in the world. And so where far right christians would be worried about theological issues in regards to Iran and Islam, the secularists had their own agenda in mind. There's also cookies. Everyone loves cookies. I fail to see how religious belief has to do with Atheists abilities to procreate. I've known Atheists with families large and small. Furthermore, just because the parents are of any particular belief set (religious or not), a persons beliefs are ultimately their own personal choice. If our parents determined our beliefs, then we wouldn't have any converts in this forum, and the forum would be made up strictly of descendants from traditionally Orthodox countries. While the groups of religions have changed throughout the years, Atheists have always existed. You can't tell me that there has ever been a time in History when 100% of a given population believed in whatever the popular religion of the day was. It's impossible. Heck, there are even Atheists who go to Church, so you can't say that everyone in a Church believes in God. Also, I don't understand why an Atheist participating in any holiday celebration should bother you. My best friend from childhood was born and raised Catholic, but became Atheist/Agnostic as an adult. Her husband, although raised Jewish, considers himself an avowed Atheist. Yet every December they celebrate Hanukkah and Christmas. For them, it is a time of year to get together with family and friends. I may not agree with their beliefs, but I don't begrudge them the celebration. If you don't want Atheists telling you how to celebrate the Nativity of Christ, what right do you have to tell them NOT to celebrate it? Although this is more common in Europe, and was common in the US during Colonial days, in today's American Commercial Society, the season of Advent and the Celebration of the 12 days of Christmas has fallen out of style. They are trying to convert the day into something else. It's been turned into a celebration of winter more than anything else. I agree. Why would we want to exclude anyone from our celebrations? Our own home is open to anyone who wants to celebrate with us and every year that includes atheists/agnostics; much loved family members. Other years it's included muslims and sikhs (and the delicious taste of India added to the traditional English goodies on the table!). I have actually had this experience. My cousin is a Christian married to a Muslim and had her husband's family over for Christmas last year. We didn't give each other any religious greetings (or any greetings at all specific to the "holiday" season). We did have dinner together and they were nice people. There was both a ham and a turkey and My cousin's husband bought some pork products to send home with family members. Someone briefly brought up religion once, but I just listened to (without getting involved in) the conversation die after about two sentences and that was it. The whole night was much more peaceful than what I was expecting. It's western. For us, the leavetaking of Nativity is December 31, so Dec 25 - 31 gives us seven days. However, we continue to be fast free up through January 4 which gives us eleven days of feasting. A celebration of commerce and romance in the winter. All the Christmas songs are designed to make you feel out of place if you ain't partnered up. It really is a romantic time of the year. You have no idea the penance I am proscribed for all the pain and loss I cause so many women to feel this time of year. I pretty much attempt to look like a homeless person during the winter, well even more so than usual. Unkempt beard and all. And depending on the company I've been keeping, I usually smell like it as well. Nevertheless, so many a broken heart. Oh the crosses I bear! That's very naive and it sounds like a rationalization to me. Well, Seinfeld gave us a great alternative holiday to Christmas; Festivus! I believe if any atheists are so opposed to Christmas and other Christian things they can still celebrate any holiday they want, but why when they can have such things like a Festivus Pole? I am told to say happy holidays here but I wont. I gave the argument that cant be refuted. Kwanzaa, Hanukkah, Yule, etc are not national holidays officially sanctioned by our government. Christmas is, so when my work tells me to stop saying, Happy Independence Day, I'll stop saying Merry Christmas. It makes all the atheists mad but what can they do really? Arrest me? They can fire you for being insubordinate. Yeah don't let this hill be the one to die on. Wont happen. Not here where we're at. That would be a death sentence locally. Most Muslims that I have known don't have a problem with Christmas, as they see it as honoring the birthday of a Prophet. Also, most Muslims have a tremendous amount of respect for the Theotokos. I've also known a Muslim or two to put up a Christmas tree and exchange presents. 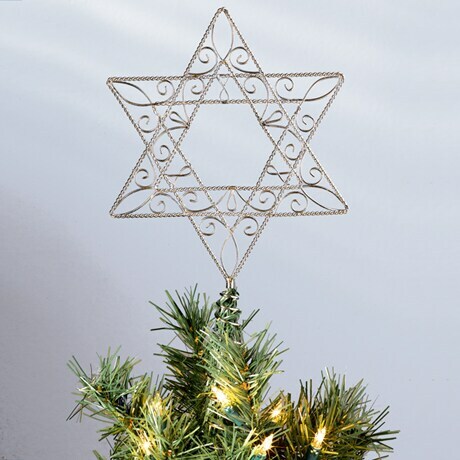 I've also recently seen Star of David tree toppers. I guess everyone gets into the holiday spirit these days! I just see alot of folks that take issue with Christmas tend to have chips on their shoulders about alot of stuff, and they're waiting with baited breath to be "offended" by things. I know here in a uber-heavy protestant Christian area, the Jews, Muslims, and even the Atheists dont have a problem usually. I know the local synagogue even hosts a Jewish food festival during the time. I think you're confusing religion and culture, they certainly influence each other but are quite distinct, a rejection of religion does not entail a wholesale rejection of culture. And I'll even do you one better, the rejection of religion doesn't even negate the value of religiously inspired art or music, even as an atheist I can appreciate the artistic value of a Traditional Mass or a Taoist Liturgy. Atheism is simply the realization that the hypothesis that a deity exists is highly improbable; now this realization may inspire certain ideals or preferences, but on the face of it, that's all there is to it. The truth is, you guysChristians are just another brand of consumer driven buffet cultural ChristiansPagans! You can't strip away everything christianPagan from your life. There will always be some vestiges still left. Even if you are unaware of them. How soon you forget your own history. Your atheistic children will be able to see and may become more consistent in their atheism. But at the end of the day atheism can't really survive on it's own. It's a parasite that needs religious people to feed off of. As individuals you guys need to marry religious people for you can't really survive on your own. You guys are way too small a group. And if atheistic families only produce one child then they will either die out or will always be an extremely small minority. Atheism is not an ethnic group, atheists aren't made by two atheists having a child together. In fact, most atheists have come to that realization on their own. As for the future of atheism, from where I'm standing things are looking pretty good. The younger generations are adopting atheism on a large scale, especially in Europe, and most of these atheists didn't have atheists for parents. Atheism is the result of the advance of science and widely available education. The correlation between education and the lack of religious belief is almost uncanny. So unless the modern world is destroyed and we descend back into the bronze age, you'll forgive me for not giving your prophecy much credence. Did you know that In Greek Orthodoxy there are twelve great feasts and that Christmas isn't even in the top of the list. In fact If I'm not mistaken. If falls somewhere in third or forth place after The Repose of the Virgin Mary August 15. Now if God truly wanted us to know the date he was born it would have bin documented somewhere. It clearly wasn't so the day seems to have bin placed there by the scholars back then to compete with pagans and it eventually won out. This is not surprising to me at all.. Religion is as much cultural as it is spiritual. Many folks, even in Orthodox, attend services, sing songs, dress in ceremonious clothing, and celebrate holidays for cultural reasons rather then strictly religious. It is the same with Christmas. Folks who do not necessarily believe in Christmas do in fact still appreciate the cultural significance of carols, Christmas imagery, family gatherings, and the generally festive atmosphere. Further, many folks are capitulated in nostalgia for their childhood or a different time, and associate this with the holidays they experienced then but today may not as strictly believe in as then. When I got one of my first jobs in public education, the interviewing teachers were both Orthodox, and my priest had written me a letter of recommendation because all my experience at the time was only in the Church. During the interview we had a lovely discussion about Orthodox, and not in the context of religion (after all it was a job interview, not post-liturgy coffee hour ) but rather in the context of cultural expression. Religious culture gives folks an outlet for cultural expression. After all, if you don't believe in God, still the concept of God is relevant in the concept of accepting the circumstances of reality, which is what the gods of Homeric Epics represent and symbolize. If folks don't believe in Zeus, surely from the Odyssey they can understand how Zeus represents Odysseus yielding to the conditions of reality which are beyond human control, be these simply natural forces, social forces, or Divine. Folks who discredit the Divine obviously favor the first options, and for them the imagery of Christmas can serve the same function, as an expression of culture, family, history, identity, social roles, values, etc etc.. Religion is art, and art is open to interpretation, and no body has full control over art, be it a painting, literature, or music. Some of my Reform Jewish neighbors used to do that as well, especially those whose parents were in interfaith marriages. In discussing about how religion influences culture, and how even though one may "lose their religion, they still want to reap the benefits of the culture." It works the other way around as well. My 92 year old Grandmother, despite how many times I explain it to her, cannot understand why her Hindu neighbors do not celebrate Christmas, and why Muslim women will continue to wear a ḥijāb (حجاب ) , even though they may be American citizens. Considering that her ancestors were forced to convert to Christianity from Judaism in Ukraine, you'd think she'd be a little more tolerant of religious differences, but it's really not the case.